In my opinion breastfeeding is the absolute best start a baby can have. ( if possible for mom and baby both) Not to mention the best economically. Formula is so expensive nowdays. The baby seems to have less tummy troubles when breastfed too. I nursed all of mine and let me say it was so much easier in the middle of the night than making bottles lol. No mixing bottles, and no heating them. When I went back to work after maternity leave I pumped into bottles. I bought breast pads and they were the disposable kind and they can be pretty expensive. 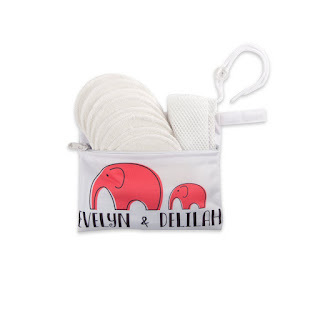 I received these Washable Bamboo Nursing Pads with Laundry Bag and they are so nice! They're really soft and made with 4 layers, a soft absorbent layer that goes against your skin, the side that goes against your bra is waterproof so nothing leaks out onto your clothes, and 2 microfiber inner layers that are very absorbent and keep your skin dry. This set comes with 8 washable, reusable nursing pads, a laundry bag to wash them in, and a cute carrying bag. These pads are the perfect size, 4 inches across. They are discreet enough to wear during the day and absorbent enough to wear at night and they don't bunch up in your bra.